It is vital to be active participants within our communities. As an organization, Berry Architecture + Associates is committed to enhancing communities through the built environment. Outside of our professional abilities, we also believe it is vital to be active participants within our communities. 2018 marks the 10th year of the Wellness Ride benefiting the Canadian Mental Health Association–Central Alberta Region and the Central Alberta Brain Injury Society (CABIS). All funds raised stay in the community and go to support services and programming for individuals and families impacted by mental health issues, addiction, and acquired brain injuries. Berry Architecture has been the title sponsor of the event for nine years. This year’s event took place on Saturday August 11, 2018 in Red Deer. Cyclists of all ages and abilities took part, riding either 10km, 25 km, 50km, and 100km. The 10 km and 25 km rides wind through the beautiful trails of Red Deer, while the longer distances tour on the highway from Red Deer to Delburne and back. 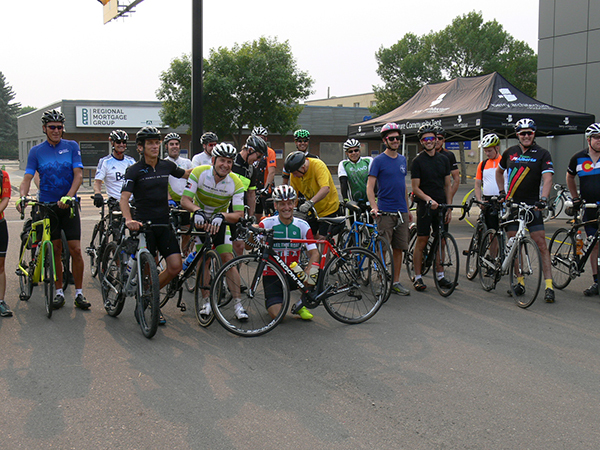 This year, 65 riders took part and raised over $35,000 with pledges and corporate sponsorship. Berry Architecture is also a long-time supporter of the Foundation for Red Deer Public Schools and has supported the Awards of Excellence program and the Finish Line program for many years. As an organization, we have supported a wide variety of local charities and not for profit organizations through donations, volunteering, and ongoing sponsorship, as well as pro bono and reduced fee professional services. As individuals, we encourage our team members to volunteer in the community in their own areas of interest. Berry Architecture believes in giving back to our community and making our Alberta home a great place to live and work.